ACTV Studio Sessions Presents The Very Talented Imogen Croft Performing Adele’s Hometown Glory! This is Imogen Croft performing Adele’s Hometown Glory ‘exclusively for ACTV. This is a Studio Session, Acoustic cover. Please take a look at other ACTV videos and also Subscribe! Patrick Channon Promotes His New E.P By Performing His Own Original Track Called Headlights for ACTV! You can download Patrick Channon’s new E.P called The Long Man EP for FREE! you can download it by following this link… http://patrickchannon.bandcamp.com/album/the-long-man-ep There is nothing better than free music that is great to listen too! This is Patrick Channon performing his own original song called Headlights ‘ exclusively for ACTV. This is a Outside Session. 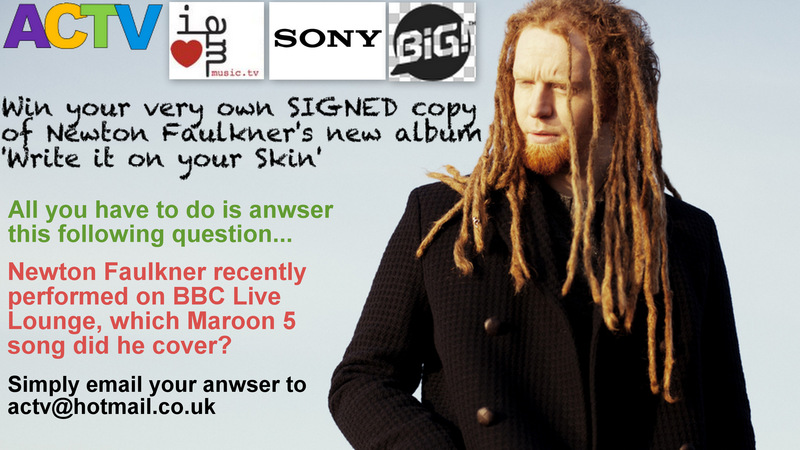 WIN A SIGNED NEWTON FAULKNER ALBUM! Newton Faulkner has recently performed on BBC live lounge but which Maroon 5 song did he cover? Email your answer to actv@hotmail.co.uk and the winner will be chosen at random on the 22nd July! The winner will be announced on ACTV and all the social networks below. Jester and the Pickpocket Perform a Bob Marley Cover In There Own Bluesy Way For ACTV! This is Jester and the Pickpocket performing a cover of Bob Marley’s Three Little Birds ‘ exclusively for ACTV. This is a Outside Session, Acoustic cover. This is The Intermission Project there original song called Give me Joy ‘ exclusively for ACTV. This is a Outside Session. The Intermission Project have recently been on the main stage of Lounge on the Farm in Canterbury. I first listened to The Intermission Project when they entered a competition called ‘You say they play’ which is to get a slot on the main stage of Lounge on the Farm in Canterbury which they went on to win and have recently performed on the same stage as The Wombats. I got in touch with Alex Stevens on Facebook about a possible ACTV recording… they then wanted to do a few video for ACTV so we met in Canterbury and found a nice garden (which was a struggle to find) and started to do a session – as I love there song ‘Give Me Joy’ I asked them to perform it, if it was alright with them, after they finished recording ‘give me joy’, I thought they was more amazing then I thought they was going to be, Jim (on left) and Alex (on right) have voice’s that go perfectly together and I believe if they keep on going the way they are hopefully they go far in the music industry. Alex and Jim (The Intermission Project) were a great laugh especially when we had difficulties recording the intro for one of the songs. Hopefully we hear alot more from The Intermission Project and I hope to do more music stuff with them in the Future. The Talented Canterbury Singer Phoebe Warden Performs Jessie J’s Do It Like a Dude for ACTV! This is Phoebe Warden performing a cover of Jessie J’s Do it Like a Dude exclusively for ACTV. This is a Outside Session, Acoustic cover. Talented Cannon Woods Perform Ed Sheeran’s You Need Me, I Don’t Need You! This is Cannon Woods performing a cover of Ed Sherran’s ‘You Need Me, I Don’t Need You’ exclusively for ACTV. This is a Outside Session, Acoustic cover. Original Song by the One and Only Ross and the Wrongens Called Forbidden Love! This is Ross and the Wrongen performing there own song Forbidden Love’ exclusively for ACTV. This is a Outside Session, Acoustic cover. A Must Watch Video of Matt Wood’s Performing Prince’s Purple Rain and Damien Rice Cannonball Together! Download Matt’s E.P for absolutely nothing by simply following this link.. http://mattwoodsofficial.com/download/ you can’t beat free music which is great to listen too! This is Matt Woods performing two covers of Prince’s Purple Rain and Damien Rice’s Cannonball ‘ exclusively for ACTV. This is a Outside Session, Acoustic cover. David Ellis Promotes His New E.P by Performing His Own Original Song Called You Are For ACTV!